This is my first time participating in Viridian's Sunday Stamps, and I hope that I will be forgiven for stretching the theme of flowers/springtime just a tad. I am, generally speaking, not really a floral sort of girl, and I live in the southern hemisphere. These are my excuses. Although Melbourne so regularly experiences four seasons in one day (just as Crowded House sang), Autumn is the official season, so that is the one I thought I would pay homage to here. Thus, in a happily Autumnal frame of mind, I have chosen some pretty gorgeous flowering tree stamps to share (so I am sort of on-theme, right?). These stamps come courtesy of my Grandma Nellie. 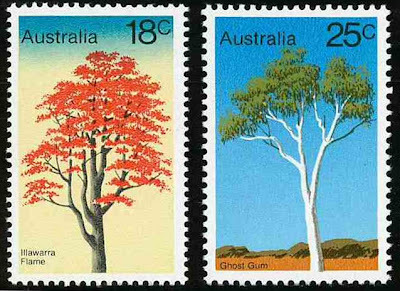 And also courtesy of my Grandma Nellie is her (slightly out of date) 1980 catalogue of Australian Stamps, which tells me that these tree stamps were released in June 1978. 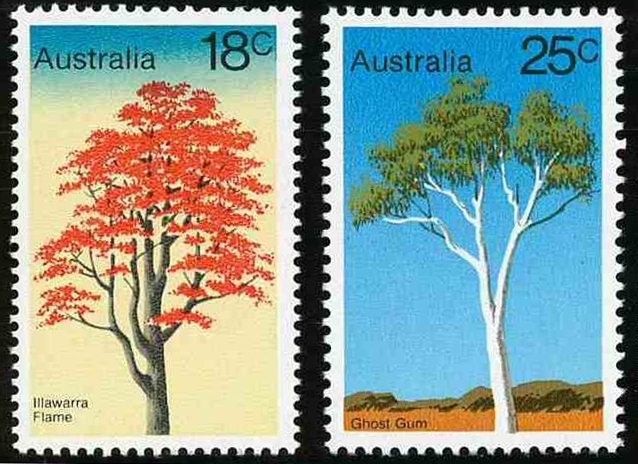 I think these stamps are so exquisite, partly because of the beautiful matte colours used, and the strikingly simple designs; and partly because the trees illustrated are so distinctively Australian. I can't even pick a favourite stamp from this series! I hope you have enjoyed these stamps as much as I have. Thanks for letting me participate in Sunday Stamps! I am glad you found Viridian's blog, so that I could find you! I love these stamps for their simplicity. Sometimes these can show more detail than a photograph stamp. I agree - I think it is the simplicity of these stamps that make them so awesome! They definitely have a different kind of appeal to that of a photographic stamp. Thanks for checking out my blog! Those are nice stamps and I'm glad you stretched the theme. Please stretch the theme! That is what I hope people do. 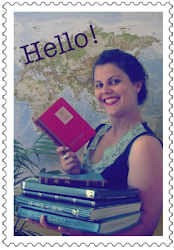 I am so glad another stamp lover joined us. Thank you for participating. Four beautiful stamps to treasure. I'm gald you've joined us. The stamps I think are a perfect example of why simple is best. 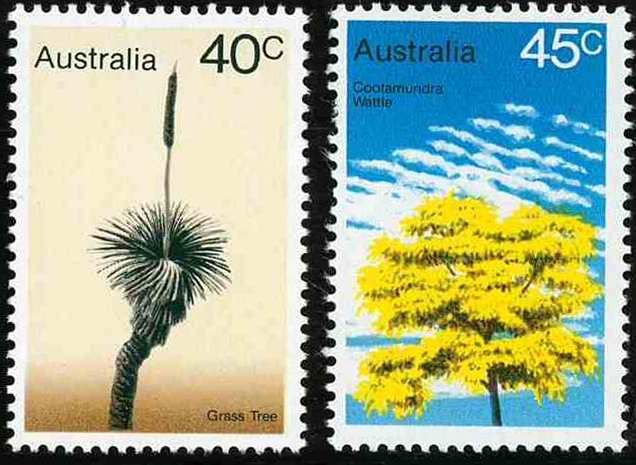 I enjoyed your Australian trees, and their names. Great designs. Glad you have found Sunday Stamps. These are lovely. I have a friend who has just emigrated to Melbourne so these made me think of her too - thank you. I only take part in Sunday Stamps occasionally too but it's a fun meme.